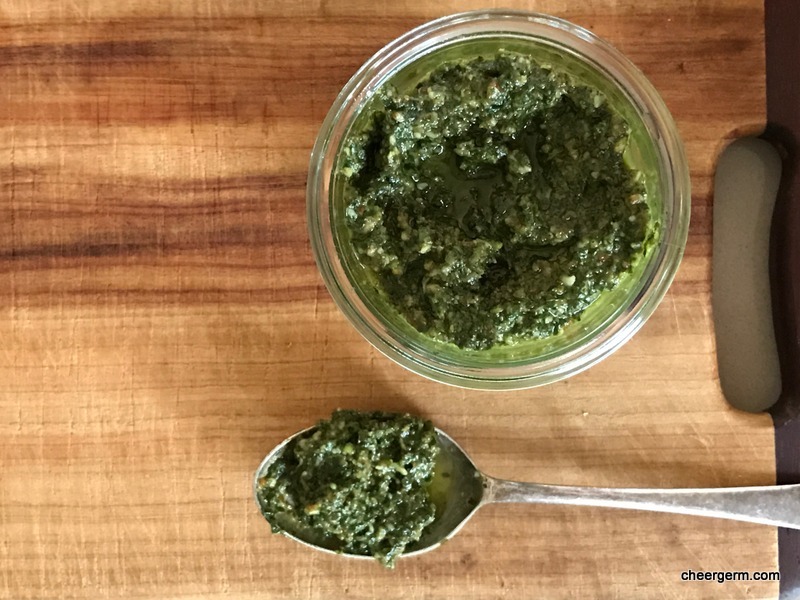 A traditional Italian pesto from Genoa contains pine nuts so in a way, this is a charlatans version of a much beloved Italian sauce. My recipe, through misadventure, contains pecans. The pecan derives from a species of the hickory tree, a deciduous tree native to Mexico and parts of southern USA. It is technically not a nut but a ‘drupe’ which is actually a fruit containing a single stone or pit and an outer husk. 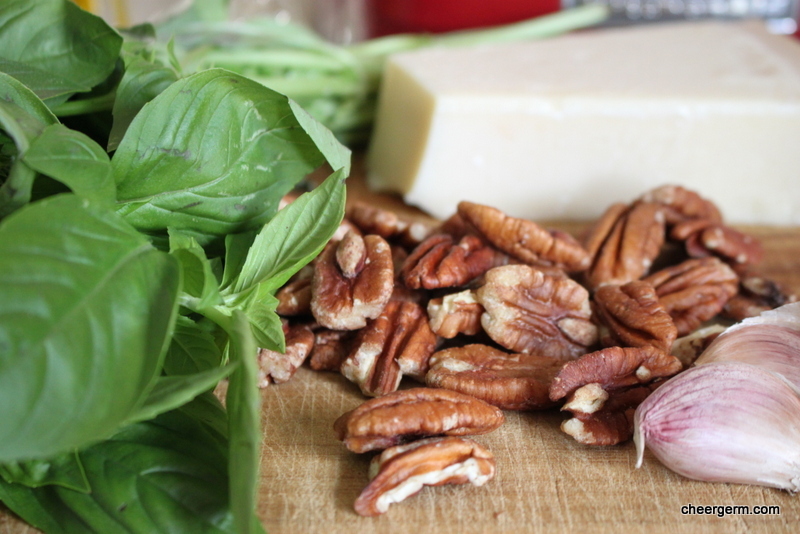 Pecans are high in monounsaturated fats and are buttery, rich and sweet. It was another overtly hot Sydney day and we were on the verge of ‘hanger’. 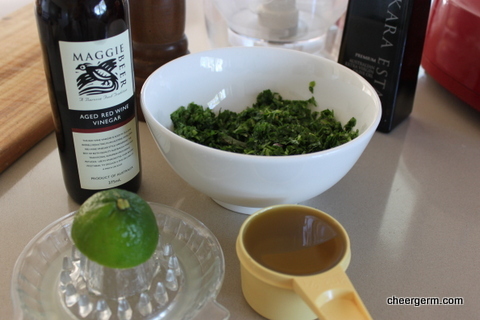 My kitchen possessed the majority of the requisite pesto ingredients. A massive bunch of basil that needed to be used, a wedge of Parmesan cheese, garlic, a bottle of olive oil but not a darned pine nut in sight. My kingdom for a pine nut! All that could be found were two big bags of pecans doing time in my pantry. (A pretty darned tough place to hang out, well, so all the other nuts out on parole tell me). In the past, walnuts, coriander and mint have been tossed into pesto sauces whereas pecans have been used for granolas and sweet baked goodies. Popping them into my pesto felt strangely wrong. However, wilting and weakened and in the spirit of the Deep South from whence the pecan originated, I declared in my best southern accent, that I just didn’t give a damn. (In other words, there would be no running to the shops in a last minute manner.) Pecans were thrown in and all was well. 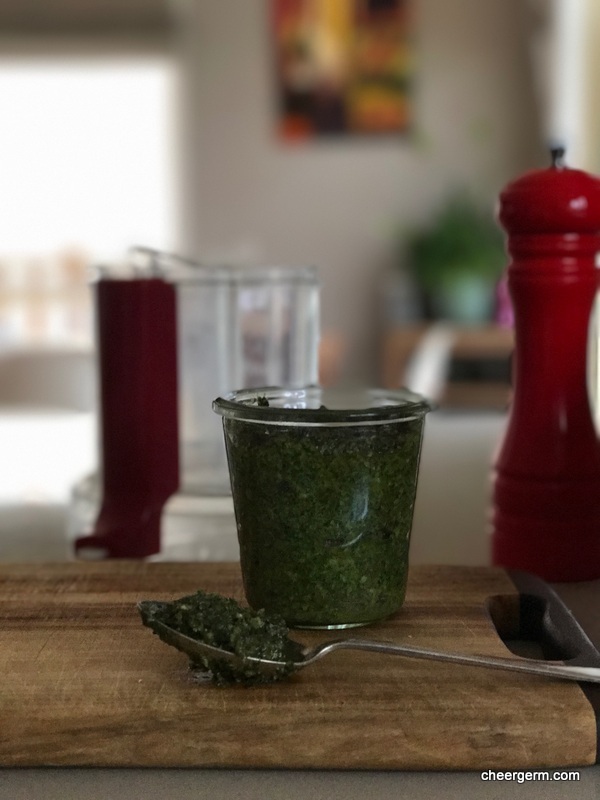 We stirred the pesto through pasta and it was herbaceous, nutty, vibrant and just the ticket for a quick simple meal. 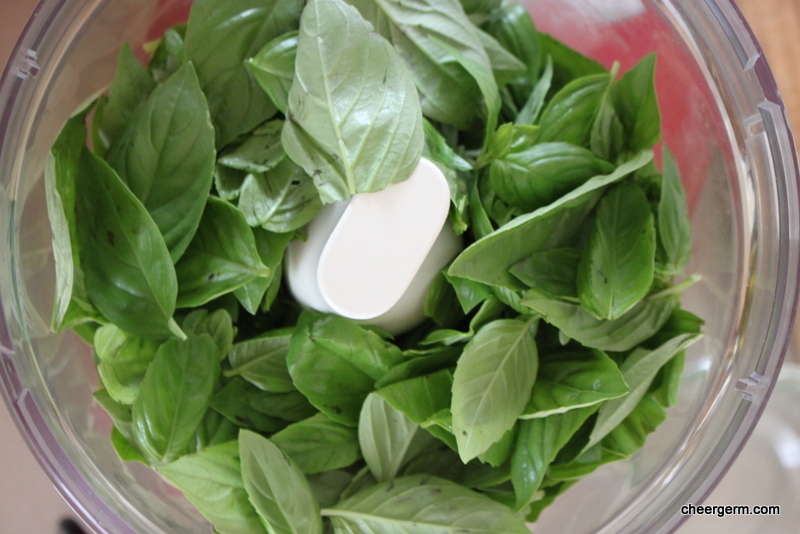 Pick the basil leaves and wash and dry them. 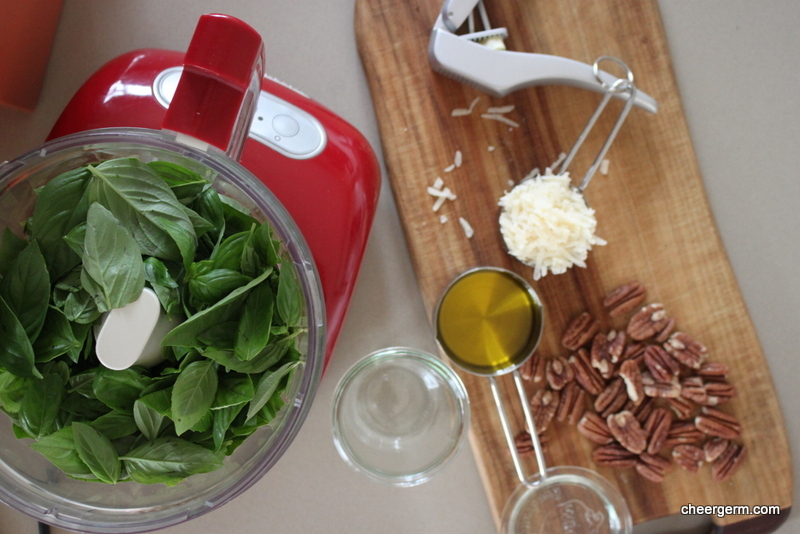 Add the basil, pecans, Parmesan and garlic to a food processor and process until finely chopped. Slowly add the oil whilst the blender is going until all the ingredients are well combined. Taste then season with salt and pepper to your liking. 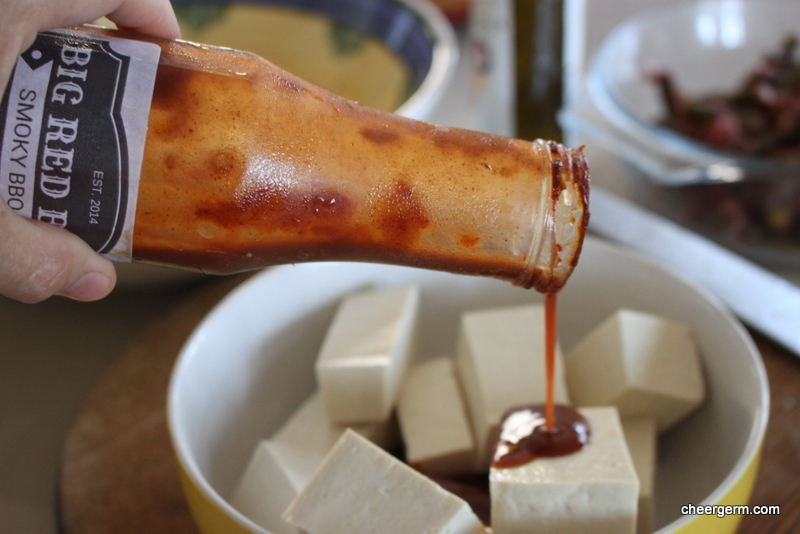 This sauce is delicious when stirred through pasta, liven up a veggie soup and dollop a blob on top or serve alongside grilled and roasted meats or tofu. Leftover sauce can be stored in a jar in the fridge for a few days, cover the top with olive oil to stop it spoiling. One of the greatest delights of this blogging malarkey has been meeting (albeit virtually) many wonderful and interesting bloggers along the way. One of those peeps is foodisthebestshitever aka Graeme, aka Grazza, aka Mr Red Bearded Carnie Man. This witty blogger shares his fresh, vibrant recipes using his own unique turn of phrase and the odd spot of colourful language. (In others words, severe language warning to all of you who may be offended.) He resides in northern NSW with his missus Jen, who also knows her way around a kitchen and their two gorgeous lads. They opened their restaurant The Stockpot Kitchen in the Bangalow Bowling Club, about a year or so ago. I look forward to the the day that we find ourselves in the verdant NSW hinterland and we are able to chow down on some of the delicious sounding US-Southern style grub. Grazza lives and breathes food and surely could be named the Carnie King of Fiery Outdoor Cooking and Artisanal Condiments. Around the end of November last year, Grazza sent me a muchly appreciated gift of four precious bottles of liquid gold. You see, he makes his own Big Red Brand condiments that they sell from the restaurant. 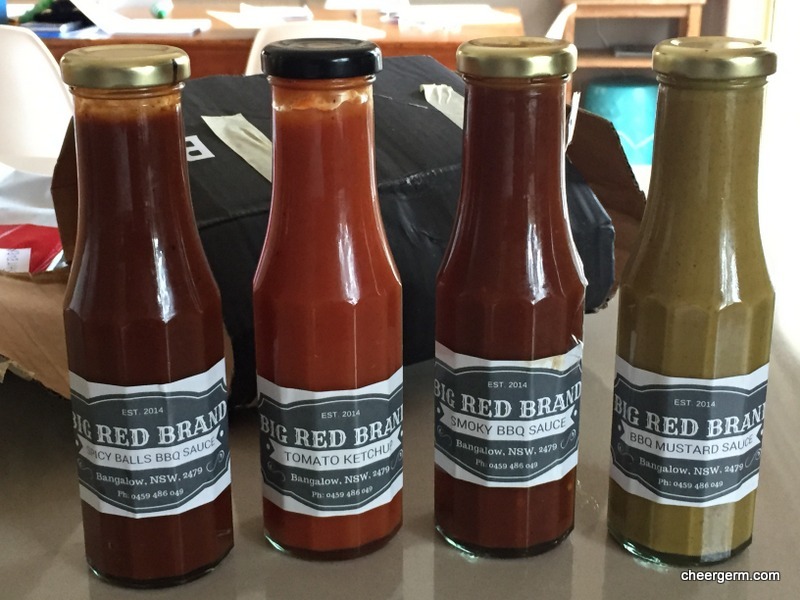 The sauces are not just a sucker punch but have a subtlety in their blending and a deft balance of sweetness, tanginess and heat. Sadly, they are not yet for sale in these here parts but who knows what the future will bring? Lately, the weather in Sydney has been very, very hot and extremely muggy. The humidity is a killer. 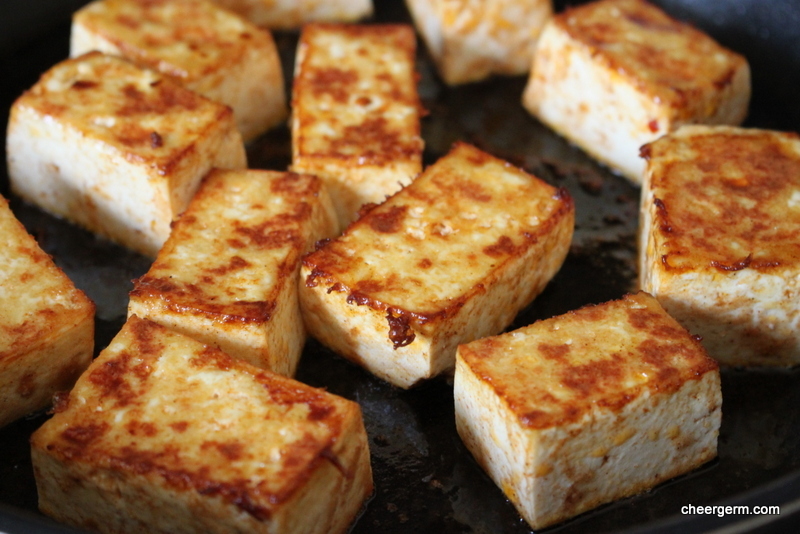 The easiest meal I could think of for my annoying coeliac vegetarian beautiful husband was marinated tofu to accompany leftovers of potato salad and Lebanese green beans . Ummm. Think we are in trouble. Back to food. I am on a pickling rampage. 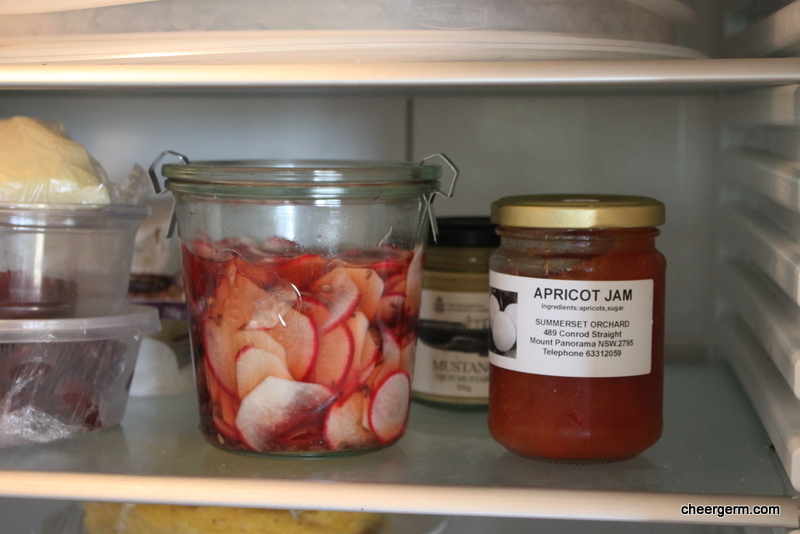 Well, that is a slight exaggeration but quick refrigerator pickles are somewhat of a revelation. If it ain’t tied down, I will pickle it. 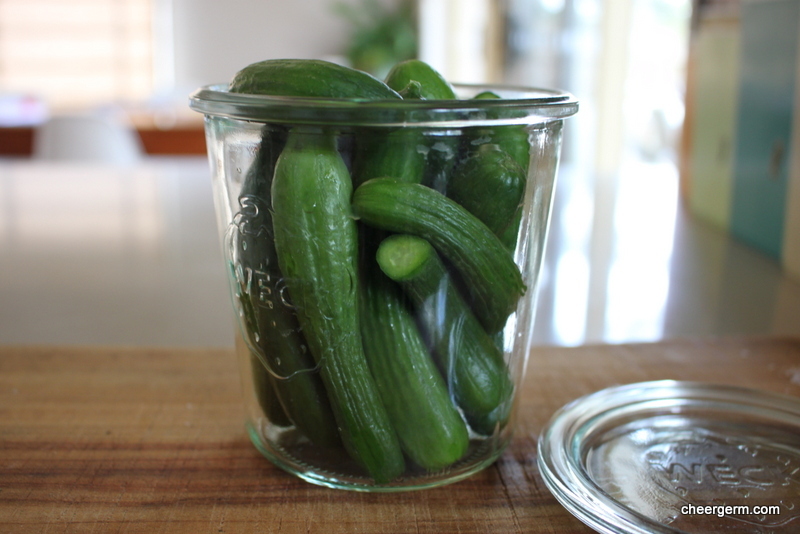 Trim any stalks off the baby cucumbers and wash and dry them. Pack them into a medium sized jar that holds about 500ml liquid. 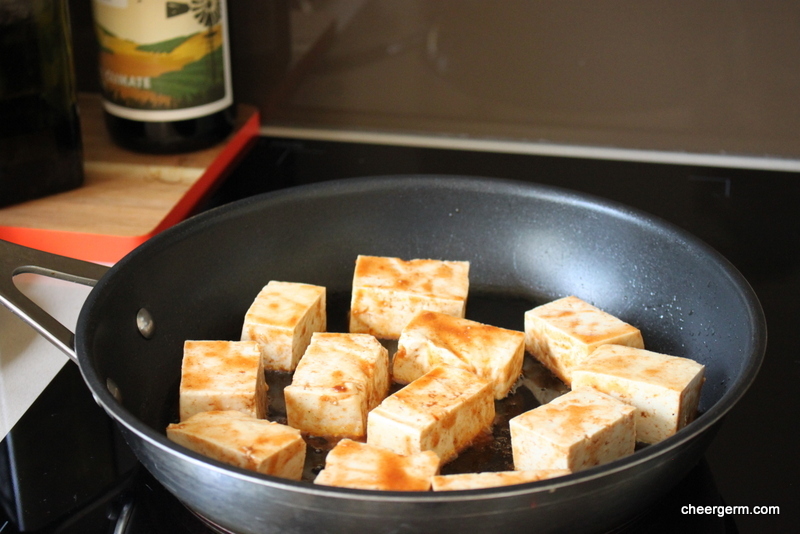 Combine the rest of the ingredients in a small saucepan and cook over a medium heat. Bring to the boil, stirring occasionally until the sugar has dissolved. Remove from the hear and let it cool down for 10 to 15 minutes. 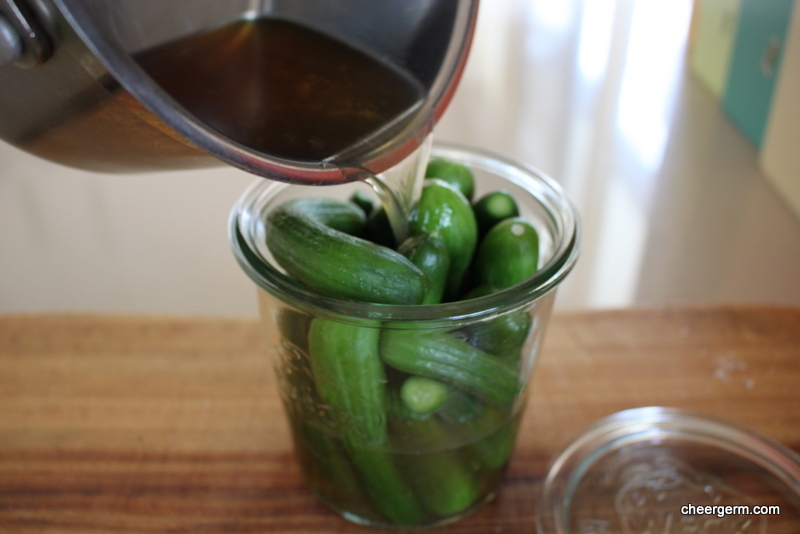 Pour the brining liquid into the jar, covering the cucumbers. Let the pickles cool down to room temperature then cover the jar and shake or rotate the jar gently to distribute the ginger throughout the jar. Refrigerate the pickles for at least one day before serving, they can last up to five days in the refrigerator. 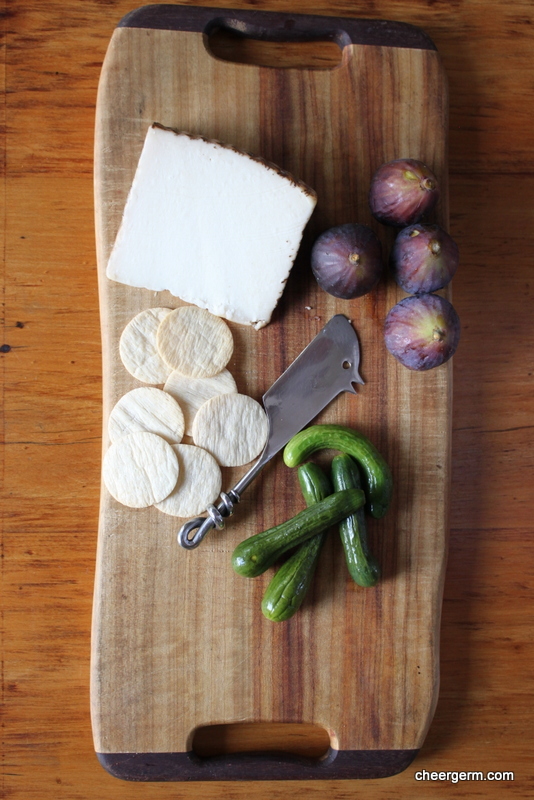 These teeny pickled cucumbers are magnificent with a cheese platter and go really well with my Miso Glazed Eggplant and Tofu Agedashi. Add to burgers, sandwiches and they are super nice when sliced and added to the top of a taco. Failing that, there is nothing wrong with eating them straight from the jar. The word ‘pickle’ tickles my fancy. For starters, it rhymes with ‘fickle’, ‘trickle’ and ‘sickle.’ (Not a word that I have had many chances to use, up until now.) Its origin appears to derive from the Dutch word ‘peckel’ which historically referred to a vinegary brine or spicy sauce, not an actual pickled vegetable. 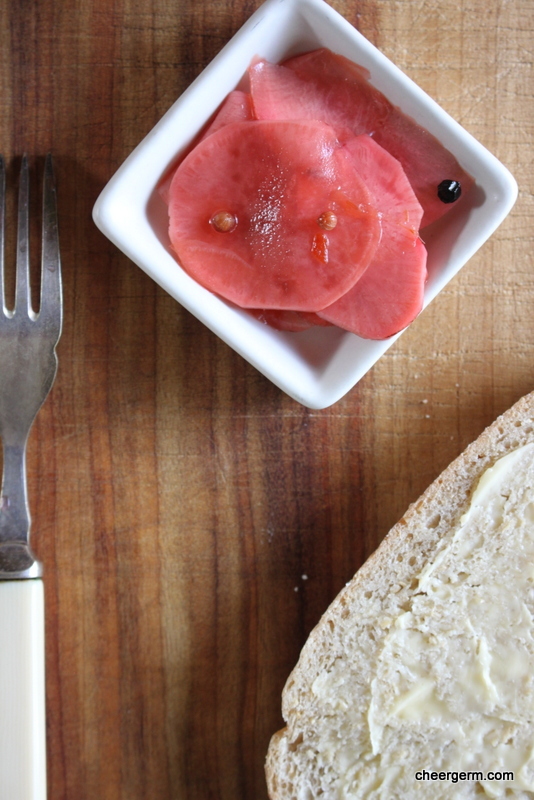 In Britain, a pickle is a relish made of chopped veggies or fruit preserved in vinegar. 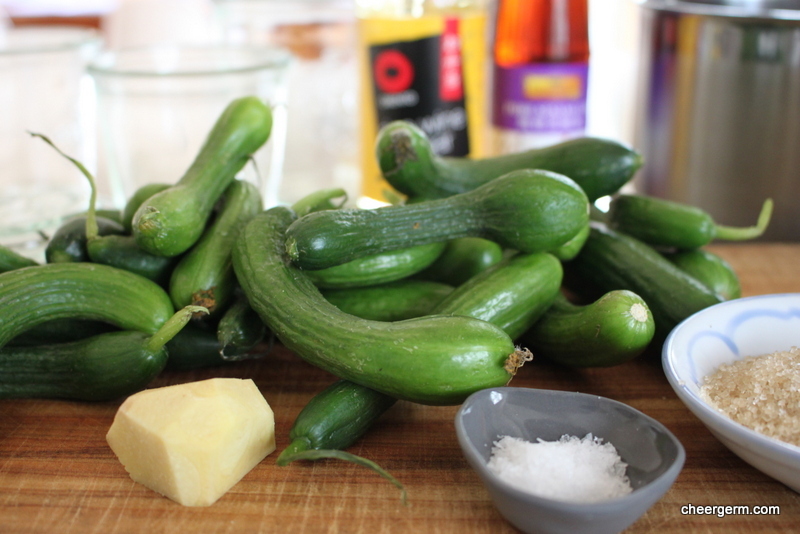 In the US and Canada, a pickle is widely thought of as a cucumber preserved in brine. 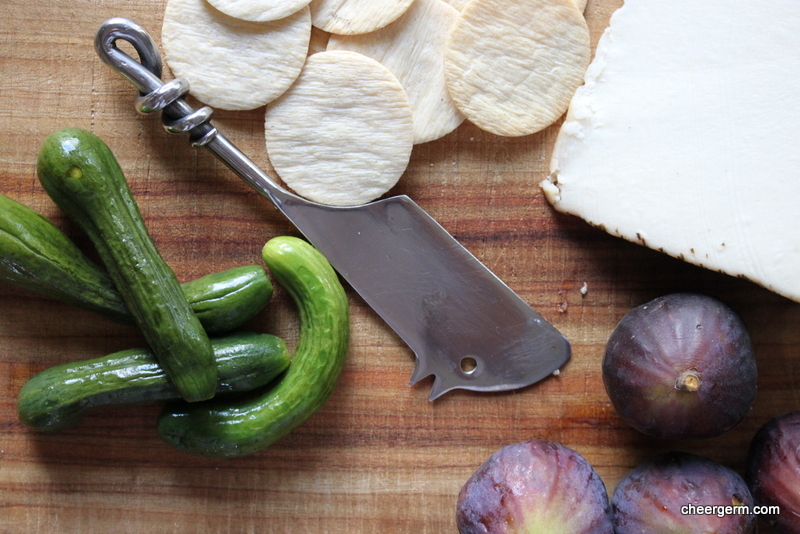 In these here parts and in much of my foodie reading, we now seem to refer to pickles as any vegetable that has undergone the pickling process. 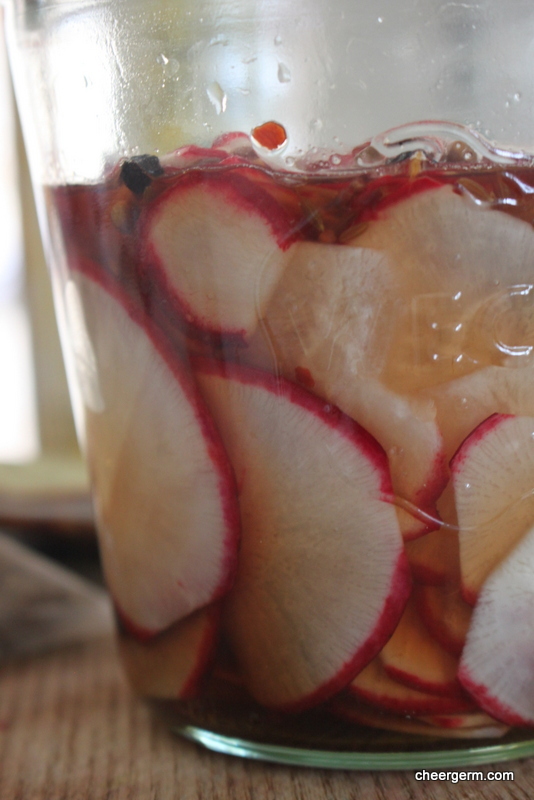 Getting ‘pickled’ also alludes to partaking of too many alcoholic beverages resulting in inebriation. Finally, all of this pondering leads me to the delightfully old-school sounding idiom ‘in a pickle’. Meaning to find oneself in a quandary, difficulty, tight spot or jam. (Now this is getting confusing.) Certainly a state that all of us who are undertaking the human experience, find ourselves in at one point or another. 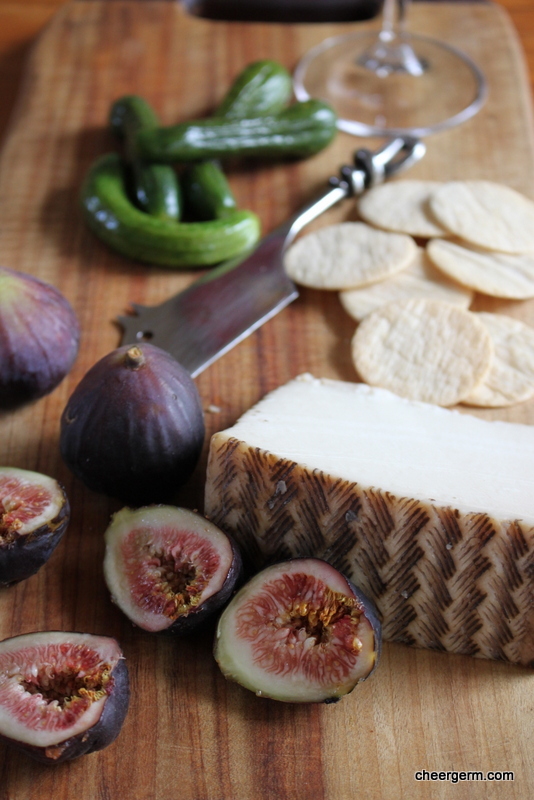 When I find myself in a pickle (the idiom, not swimming in a giant bowl of vinegary liquid), nothing soothes my troubled soul as much as spending quality time in the kitchen. 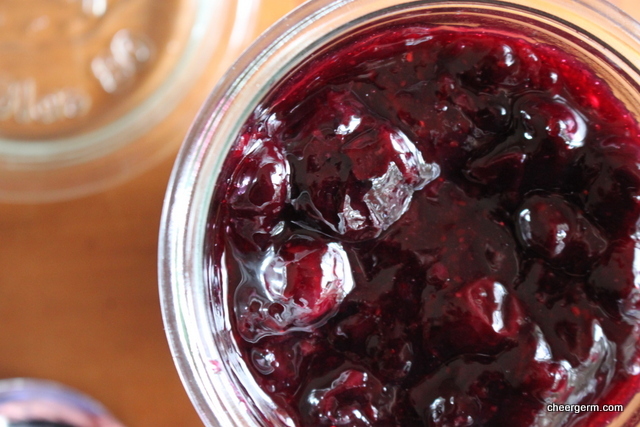 Making your own preserves is a highly satisfying process. The radish and myself are good friends. This crisp, peppery root vegetable adds zing to my salads and is a favourite snack when sprinkled with a smidgen of salt. 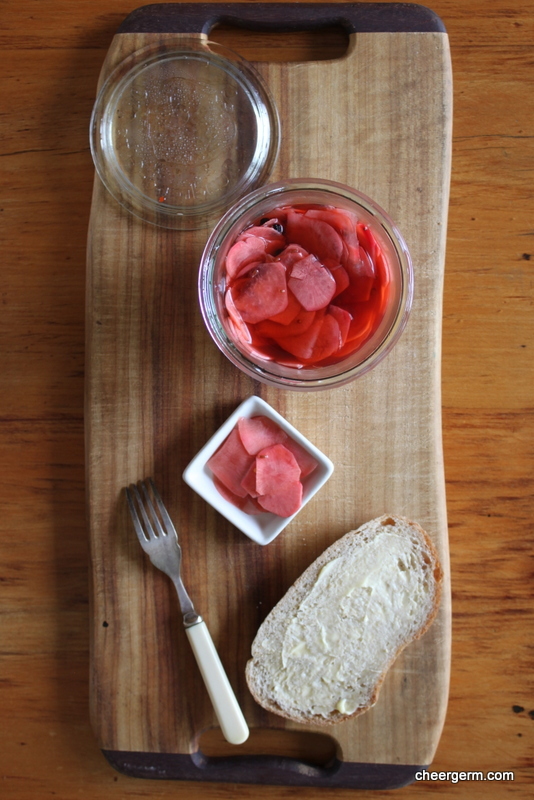 It is also delicious when pickled. This is a quick pickle, meaning you do not need to sterilise the jars and process them in a boiling water bath to ensure shelf stability. They need to be refrigerated and are at their best when eaten in the first few days after making. These rosy-hued radishes sing with a gentle hum of chilli heat and an earthiness from the Indian spices. To add freshness and zing, pop them in salads, sandwiches, tacos or burgers. 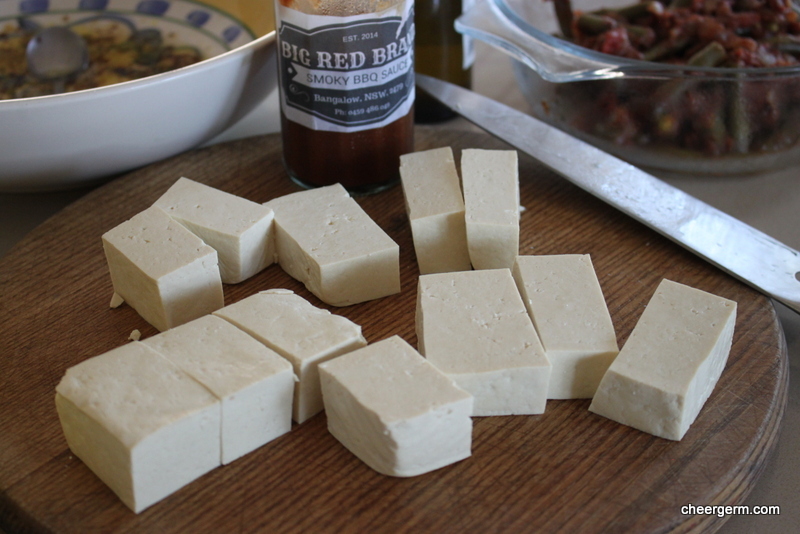 Also delicious as a condiment with cured meats, cheeses and alongside curries and casseroles. Wash the radishes then remove the green leafy tops, the bottoms and any hairy bits. 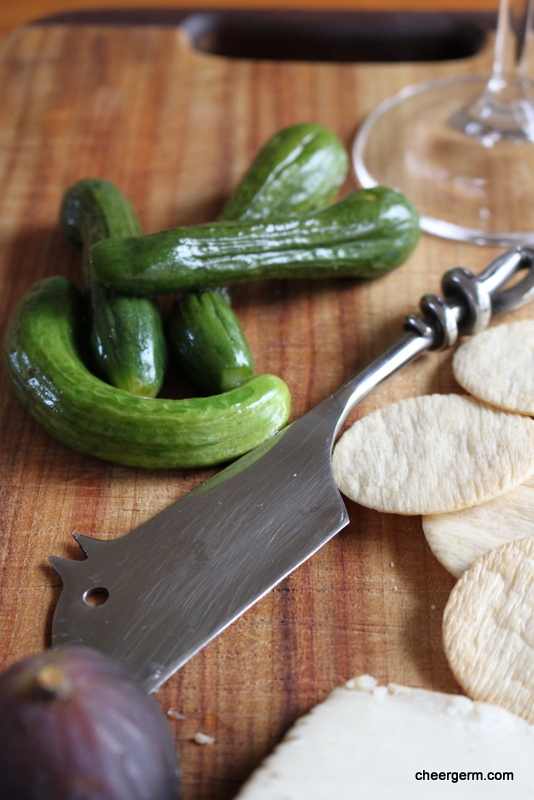 Using a sharp knife or a mandolin (please use the guard and watch your fingers! 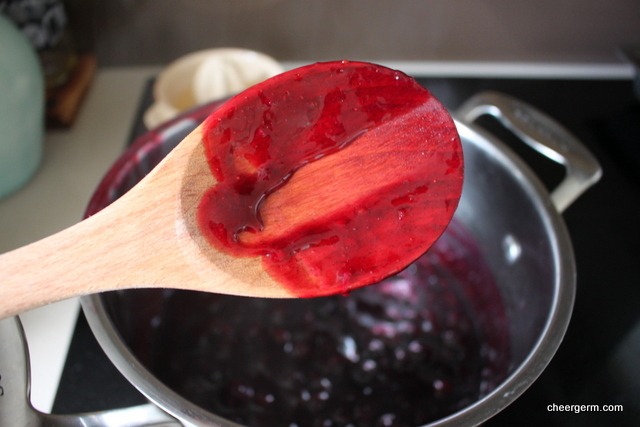 ), slice them very finely and pack them into a jar. 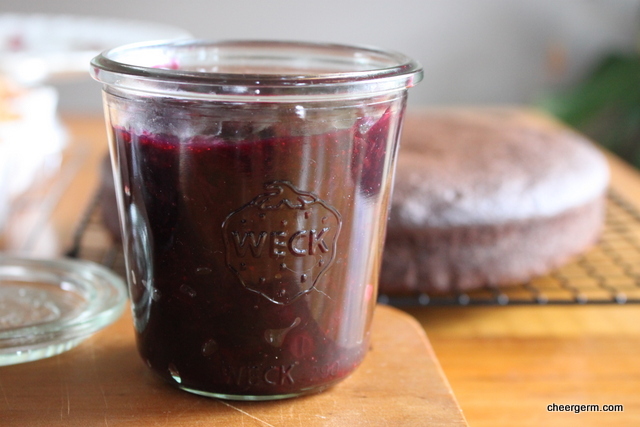 I used a medium sized Weck jar that takes about 500ml of liquid. 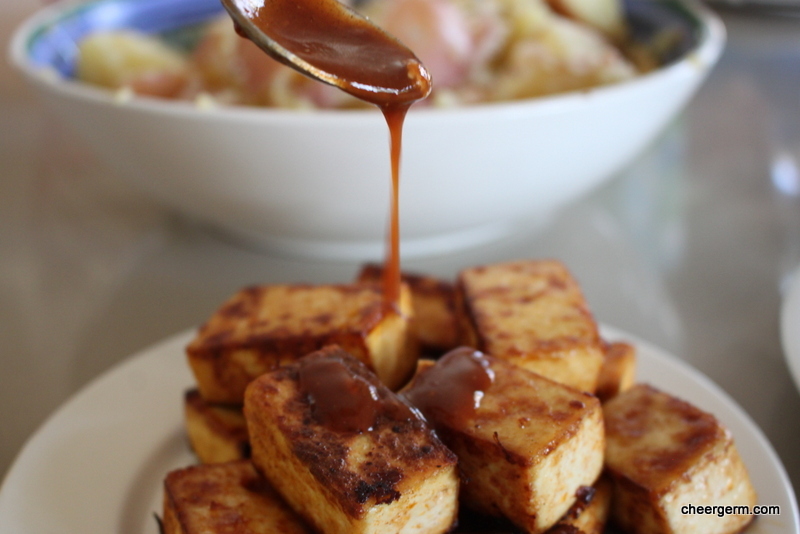 In a small saucepan, combine all of the other ingredients and cook over a medium heat. Bring to the boil, stirring occasionally until the sugar has dissolved. Remove from the heat and let it cool down for about ten minutes. 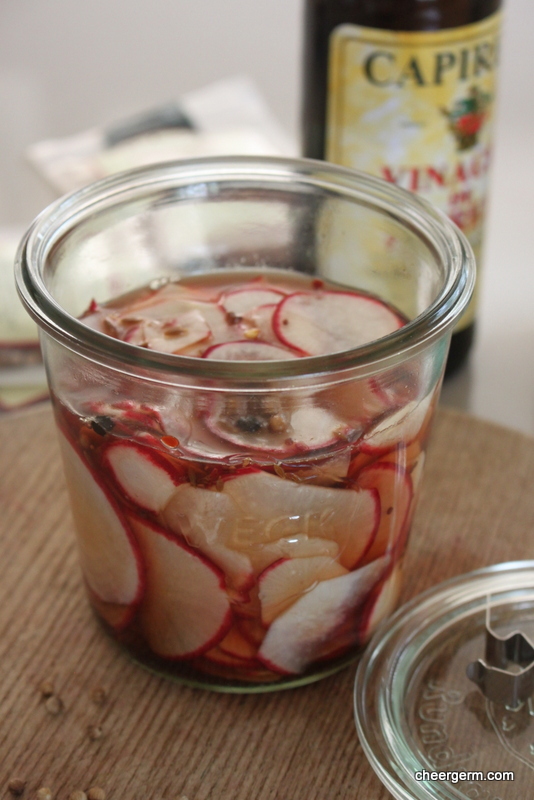 Pour the brining liquid into the jar, ensuring that the radishes are covered with the liquid. 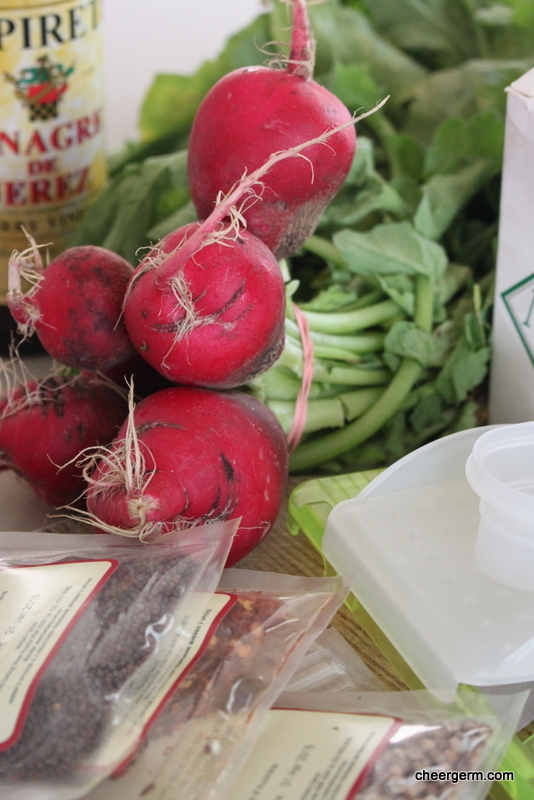 Let the pickles cool down to room temperature then cover, shake or rotate the jar gently to ensure that the spices are coating all of the radishes and refrigerate the pickles for at least 1 day before using. They can last up to five days but they are at their best and crunchiest for the first few days. Serve on a salad, alongside curries, as an extra taco condiment, with burgers, as part of a sandwich filling or alongside a sandwich. 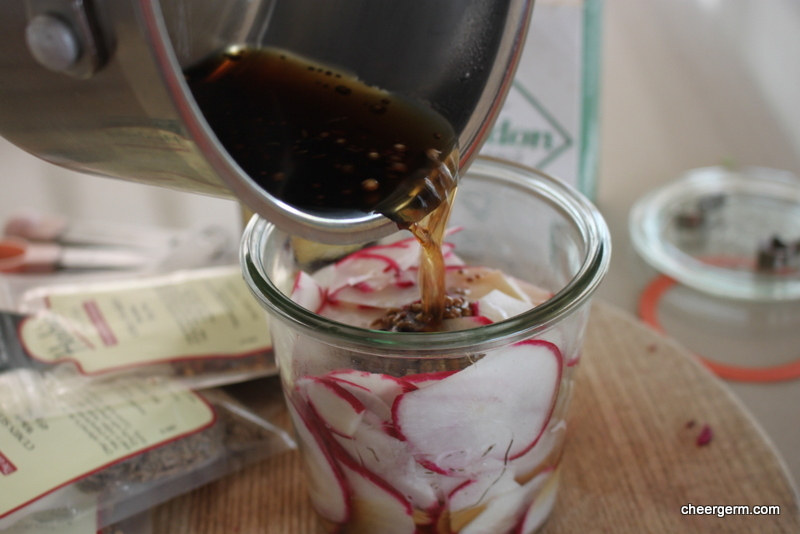 Cooking Notes: it is important to use pure sea salt and not table salt as additives can make the pickling liquid cloudy. A Cheergerm adaptation of a bunch of different recipes. So, the opportunity arose to partake in a baking competition. The event was being held to raise money for a sensory room at the school where the Mothership teaches. The idea being that your baking would be adjudicated by a panel of expert judges (in other words, people who liked food). The entered goodies were then to be sold at a big bake stall. How could I turn down the opportunity to raise money for a great cause? To me, it’s never been about the winning, it’s always been about the participating. It’s about ‘the taking part’, ‘giving it your best shot’ and all that guff important stuff. Who am I kidding? I wanted to win. Big time. The things that this Cheergerm has won in life (if you don’t count the esoteric crap such as true love, two great kids, friendship, good looks, talent) are few and far between. I do remember winning a puzzle once. It wasn’t even a particularly good puzzle. 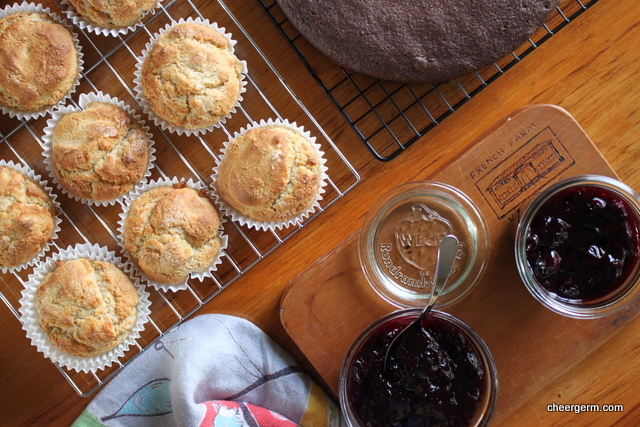 What to bake, what to bake. It had to be my never fail flourless chocolate cake recipe. But it needed to be elevated and given an extra touch that could really wow them. Basically, it had to be something that could be placed into my new German jars (that I am currently obsessed with). That way, if my cake sucked, the judges would be so blinded by my quality glassware they would hand me the win. 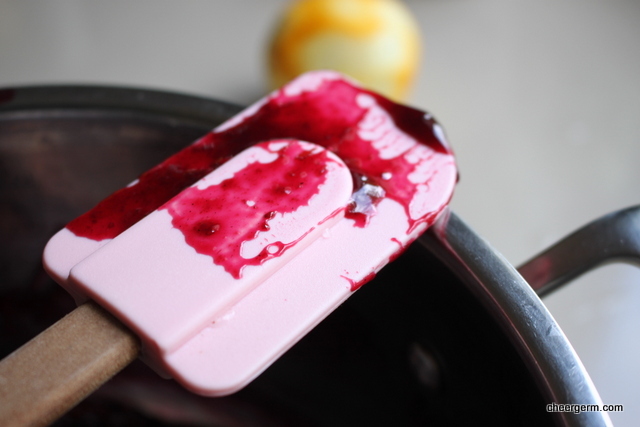 With a few fresh blueberries left and some good quality (as in they won’t poison anyone) frozen ones in the freezer, the idea of a blueberry sauce popped into my mind. A recipe was found, a few adjustments made and Bob was my uncle. 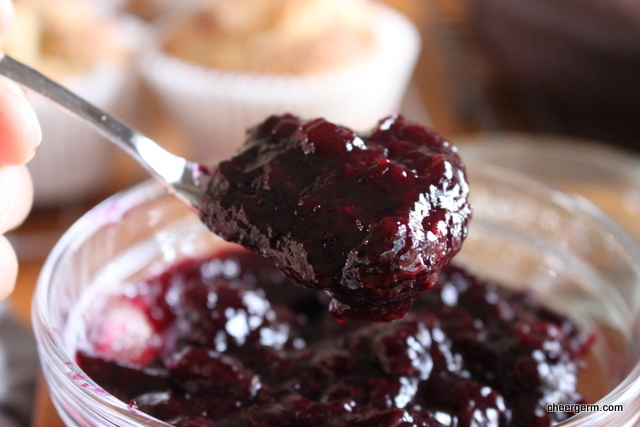 Sweet, tart and wonderfully gloopy, this fruit sauce was the perfect accompaniment to the rich, dark cake. 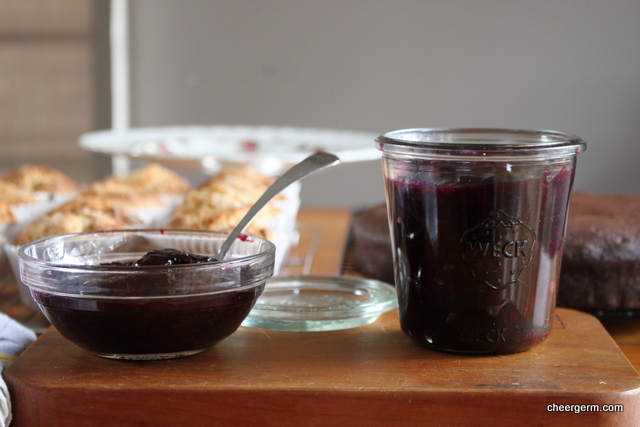 We ate the leftovers as jam. Wonderfully, a decent amount of dosh was raised. Did I win? Sadly not but the runner-up sash and smaller, far less sparkly tiara were mine. My cake and sauce were pipped to the post by mini cheesecakes. Damn those tiny rounds of baked cheesy goodness. Damn them. Over a medium heat, bring the mixture to a low boil, stirring regularly. Add the cornflour (that has been dissolved in water) to the saucepan slowly. 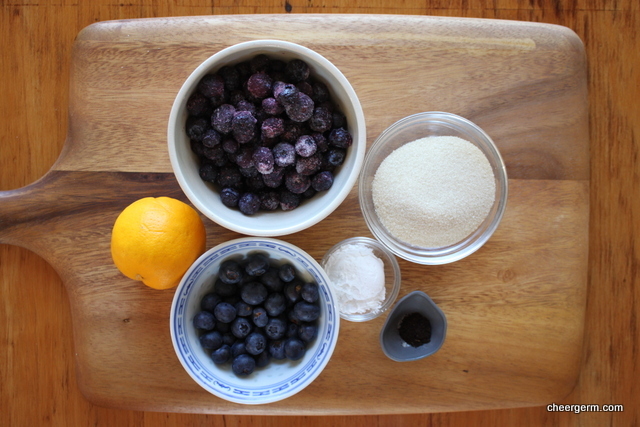 Be careful not to squish the blueberries. Simmer the sauce until it reaches the consistency where it coats the back of a spoon, this takes about 5-10 minutes. 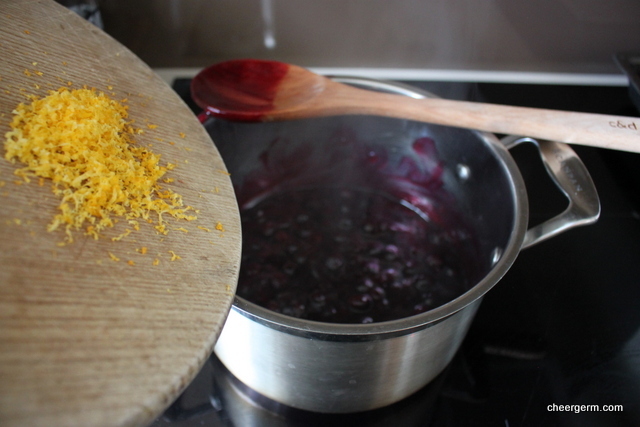 Stir in the lemon zest. Taste it, you may want to add another dash of lemon juice. I did. 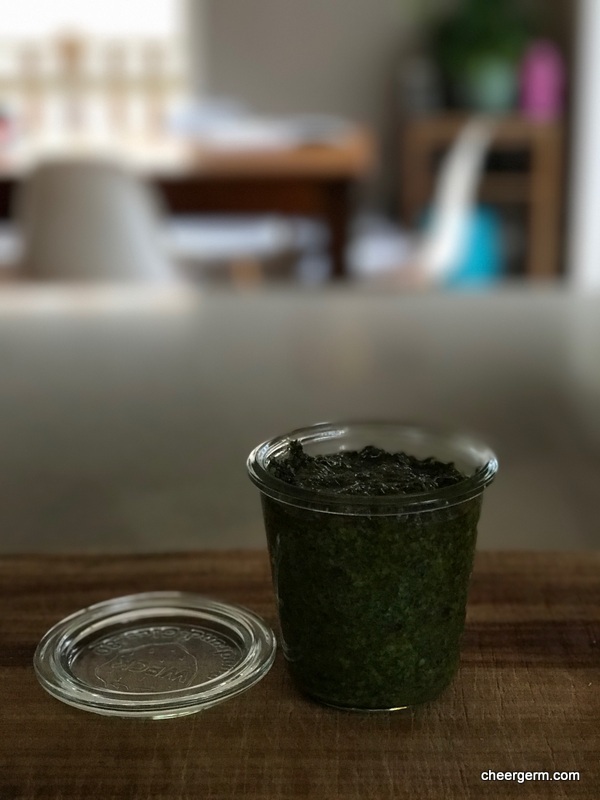 Put the sauce into a pretty jar and serve with flourless chocolate cake, with lemon muffins, ice-cream, spread on toast or just eat it with a spoon. You may just win a prize. Recipe slightly adapted from My Baking Addiction blog. See link below. She took her makeup brush, hurriedly swiped it across the product and diligently applied it vigorously to her forehead, chin, nose and cheeks. She put down her brush. Time to go, she thought and did a final check in the mirror. Staring back at her, other than the usual visage of loveliness, she now resembled a two year old who had gotten into her mothers makeup. Her entire face glowed like a red emergency beacon bobbing up and down in the ocean. It appears she had mistakenly applied her blush/rouge instead of the powder. Must wash face and start again, she sighed. We were at a girly dinner the evening our friend recounted this story to us. That same night, another friend turned to me and said ‘you have something stuck between your teeth.’ Ahh, yes, I was encountering yet another hidden danger. The old ‘herb wedged in the dentures drama.’ Nothing quite completes a well put together look like a huge chunk of parsley stuck between your choppers. It says ‘class’. It says ‘look at me’. It says ‘you know I got it going on ‘. At this point, we rely on family, friends and sometimes embarrassingly, the kindness of strangers to point out our herbivorous shortcomings. 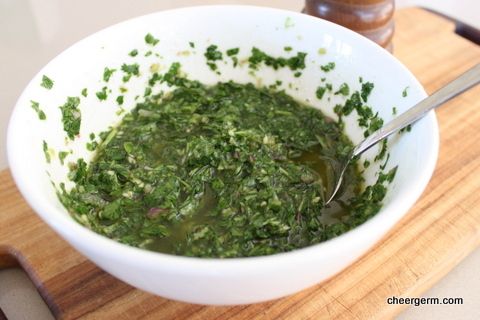 If you are willing to accept all the adventure and danger that freshly chopped herbs can bring you, I can’t think of a more exciting way to spark up grilled vegetables, meats, haloumi or eggs than chimichurri. I am currently addicted to this zingy, herbaceous South American condiment. 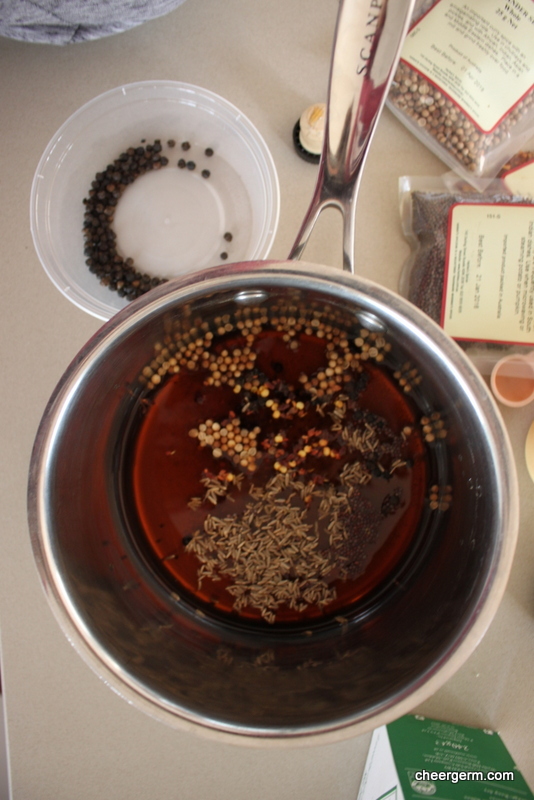 Used as a sauce or a marinade, there are many variances between recipes. Some contain oregano, some use no vinegar. The beauty is that you can tinker around until you discover how you like it best. But I beg you. Please let me know if there is something lodged between my pearly whites. This makes a large squodge of sauce and keeps well for 3 days in a well sealed container in the fridge. I found this on a website (see link below) and have made it over and over again. 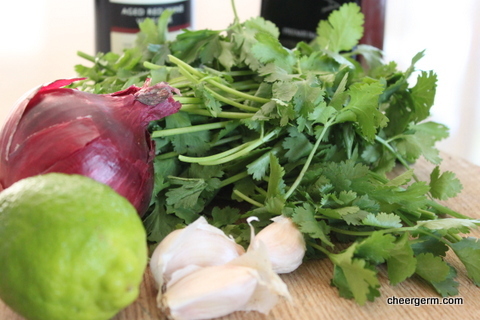 In a food processor, pulse the onion and garlic together until finely chopped. 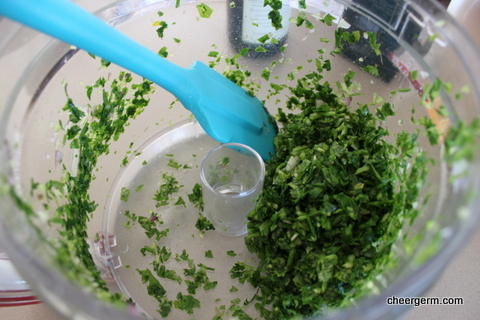 Add the herbs and pulse briefly until finely chopped. Put the herb and onion mixture into another bowl and stir in the olive oil, vinegar, lime juice and season with salt and pepper to taste. 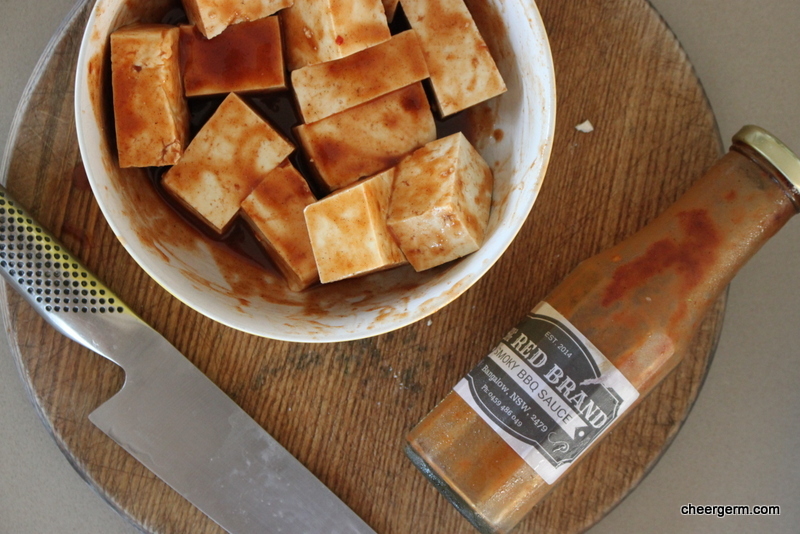 It can also be used as a marinade.